The American Adventure (Attraction) - The Mickey Wiki: Your Walt Disney World Encyclopedia! 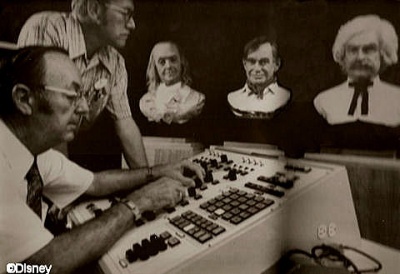 While an attraction inside the America pavilion had always been a part of the plans for EPCOT Center, its location and design changed frequently during the park's planning. Initially, in the 1978/79 EPCOT Center plans, Imagineers wanted to use the American Adventure pavilion as a bridge between Future World and World Showcase  . The pavilion would have been two stories tall, with the American Adventure attraction located on the building's second floor . Eventually however, Imagineers had decided that keeping America apart from the rest of the countries in World Showcase, would seem elitist and thus the whole pavilion was moved to the far side of the World Showcase promenade . A ride through attraction featuring short vignettes . Imagineers eventually came up with the idea of using a “Magic Theater” . The theater was designed so that it would be able to combine: Audio Animatronics, video, audio, and moving sets to tell the story of America . According to Bright, once Imagineers came up with the idea of the theater, writing the script for the American Adventure was much easier. Ben Franklin: America has been settled by the people of all nations. We are not a narrow tribe of men, no. Our blood is as the flood of the Amazon, made up of 1,000 noble currents all pouring into one. We are not a nation so much as a world.” Excuse me, Mr. Twain, Mr. Rogers. I am sure you recognize those inspiring words from Herman Melville. It seems they are going to preamble a new show called the American Adventure. It also seems that we three have been asked to be the central figures in the show. Mark Twain: The three of us star in a show together? I can see it now. Hmm! I just bet Mr. Rogers would love to step on my lines. 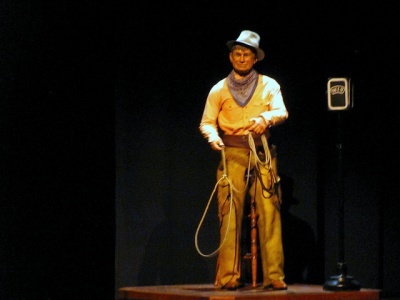 Will Rogers: Now, now, Mr. Twain, you know that’s not true. Twain: Why, Mr. Rogers, you know truth is the most valuable thing I have. Rogers: Well, I guess that’s why you use it so sparingly. Franklin: Gentlemen, gentlemen, we are not addressing the issue at hand: The American Adventure. Twain: Frankly, I’m sick and tired about all the grousing about what’s wrong with America. We should make it fashionable again to talk about all the things that are right about this country. Franklin: I agree. The time has come to make an optimistic statement about America and her people. Rogers: Well, sir, not just about the days gone by, but about today’s world and tomorrows, too. Don’t forget, we passed from the scene a long time ago. Franklin: Mr. Rogers, I’m sure that if anyone can offer a new perspective on America’s challenges for tomorrow, we can. I may have invented these bifocals I’m wearing but I can assure you they’re not rose colored. Don’t forget, that between the three of us there is a lot of first-hand experience during the first two centuries. We were there. Twain: Two-hundred years, that’s an awful lot of ground to cover. Franklin: We can each take the period we’re the most familiar with. I should host the show right through the birth of a new nation. Twain: I can cover the growing expansion of the American frontier. Rogers: I sorta guess things have been kinda crazy in the 20th century. Changes faster than any of us could keep up. Twain: Just look around us. Decaying cities, pollution, crime. I’d rather put my crystal ball in reverse. Despite technical problems and changes to the shows plot, the American Adventure was completed in time for EPCOT Center’s opening day on October 1, 1982 . The show then remained unchanged until 1993, when all new Audio Animatronics were added (which featured more fluid movements) and the attraction’s Golden Dream montage was updated . In 2007, the montage was once again updated . Stained and tinted with all colors, a seeming ethnic anarchy. Then in a little time, we became more alike than we were different. In society, not great, but fitted by our very thoughts for greatness. 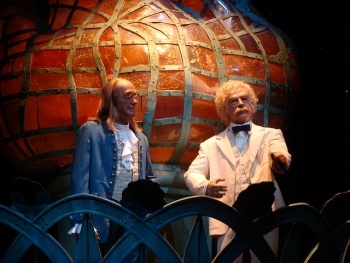 The two men then begin to banter about humility, before Twain says that the American Adventure should begin with Franklin. Franklin corrects him, saying that the story of America began even before him. As he speaks, images of ships crossing the ocean, and then a picture of the Mayflower reaching America are shown. who dream to be free. twelve weak for the mast. ill leave 'em all dead. Thomas Jefferson writing the Deceleration of Independence. Photo by Lauren Javier. First we spoke out with our voices, then we spoke out with action, with a growing defiance, that led to the Boston Tea Party. We hold these truths to be self-evident, that all men are created equal. That they are endowed by their creator with certain inalienable rights, that among these are life, liberty and the pursuit of happiness. ♫ In the days of '76, my boys, we never must revere That every man takes his musket up and fight for freedom dear. We'll hit the flanks Of the Redcoats' ranks as Yankee volunteers. Oh, the time will come When they'll be on the run As their ships will homeward sail. In the end, we the people, prevailed and achieved perhaps our greatest dream. Thirteen very different colonies became the United States of America, and we were free to become an entire nation of dreamers and doers. Yes sir, Dr. Franklin, you founding fathers gave us a pretty good start, don't ya know. We still had some things to learn the hard way. It seems a whole bunch of folks found out "We the people", didn't yet mean all the people. Even amidst the cricket song here along Mark Twain's beloved Mississippi, I hear the noise of chains and the crack of the whip. Yet there's hope. Hope born from the words of Harriet Beacher Stowe. Uncle Tom's Cabin has given our nation a key, which can unlock the slave prison to millions. Anti-Slavery is no longer a thing to be prevented. It has grown too abundant to be snuffed out, like a lantern. As Douglass drifts away, the screen once again goes dark. Then, a family portrait is shown and two brothers are heard arguing over the merits of southern succession from the Union. As their father tells them not to ruin their mother's birthday, their mother states that she is just happy that the whole family is all together. As a camera flashes (taking the families’ picture) the song “Two Brothers” begins to play. ♫ Two brothers, on their way. One wore blue and one wore grey. The family that is featured in the Two Brothers scene. all on a beautiful morning. A cannonball don't pay no mind. At the end of the song the family portrait is shown again. This time however, one of the brothers fades away due to the fact that he died in the war. Enough! Enough of your words! Let your new dawn lead to the final sunset on my people's suffering. When I think of our condition, my heart is heavy. I see men of my own race treated as outlaws or shot down like animals. I hope that all of us may be brothers with one country around us and one government for all. From where the sun now stands, I will fight no more. 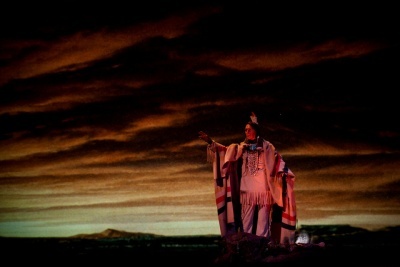 As Chief Joseph disappears, the sunset behind him turns into a starry night. Mark Twain then returns to the stage, telling guests that "The wisdom of the Great Chief Joseph, reminded us once again of our long painful journey through the frontiers of human liberty". As the scene changes, guests see the Great Hall in Philadelphia, which is hosting the Centennial International Exhibition of 1876. In front of the hall, four booths rise up housing: Mark Twain, Alexander Graham Bell, Andrew Carnegie, and Susan B. Anthony. As Susan B. Anthony gives a short speech advocating for women's suffrage, Mark Twain informs guests that they are back in Philadelphia again, and that America is a hundred years old today. Carnegie, Twain and Graham Bell then discuss the latest inventions of the day, with Carnegie summing up that it is the “age for grand ideas”. Graham Bell and Anthony chime in that it is also an era for innovation, and a dawn of new awareness. As the booths descend, guests are shown dioramas which feature the latest technological achievements. Among the inventions featured are the light bulb, trolley, moving picture, and the airplane. Following these achievements, Mark Twain observes that the country was flying into the 20th century on the wings of invention and the winds of change. Because of the changes happening in the country, Twain observes that we needed people like Teddy Roosevelt and John Muir to lead us. Then start it here and now. Make this valley a part of Yosemite National Park. Following the proposal, the rock that Roosevelt and Muir had been standing on lowers into the stage. Mark Twain then comments that that "Ready or not, we were soon thrust into the hectic role of a world leader and into the war to end all war". Following this proclamation, footage of World War I is shown, including a video of the Sopwith Camel, with the caption, "Another enemy airplane falls to America's gallant ace Captain Eddie Rickenbacker.” After this, the scene changes again, this time to a parade being held in honor of Charles Lindbergh. A news report is then heard, during which the newscaster tells guests that Lindbergh successfully made a solo flight across the Atlantic Ocean, aboard his plane the “Spirit of St. Louis”. As the newscast finishes, guests hear a second newsman who tells them, that on October 29, 1929 the stock market has crashed. Following the news, a scene depicting a gas station in 1929 appears on stage. Four men are sitting on the front porch, listening to a banjo player signing “Brother Can you Spare a Dime?”. brick and rivet and vine. Once I built a tower, now it's done. As the song finishes, the men discuss the state of the country, joking about how millionaires in New York are selling apples just like they are. As the storm around them begins to let up, the gas station owner hopefully suggests that Sunday drivers might now venture out for gas. In the middle of their conversation, one of the men shushes the others so that they can listen to Franklin Delano Roosevelt being inaugurated on the radio. But ya know, it seems to me, that we was a mighty cocky nation. We had begun to believe that the height of civilization was an automobile, a radio, and a bathtub. Course now we're a lot smarter. Now Congress wants to trim down the Navy, so it will fit in the bathtub too. Ya know, it seems to me like we're the only nation in the country, that waits 'til they get into a war, before we start getting ready for it. As Will Rogers finishes, another radio announcer speaks: "Yesterday, December 7th, 1941, a date which will live in infamy, the United States of America was suddenly and deliberately attacked by naval and ground forces..."
Yes, that was dedicated to you, Rosie, tens of thousands of you across the face of America working tonight to keep our boys in the fight. We wish all of you out there, a very Merry Christmas. Following the radio announcement, Rosie and a sailor discuss the state of the battleship, before another worker emerges on a lift. She says, that it's no wonder their all working double shifts on Christmas, before Rosie tells her to cheer up, and that maybe they will all be together next Christmas. As the battleship disappears, the screen turns purple and an eagle flies across it. Sail on freedom's wind, across the sky. keeping dreams aloft in the rain. America, keep on flying now. 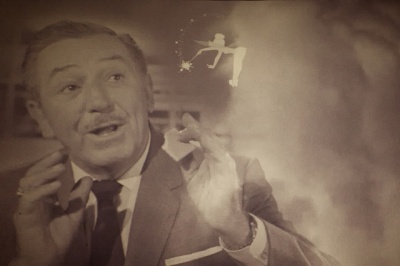 Walt Disney's image in the Golden Dream montage. John F. Kennedy giving his inauguration speech. Martin Luther King Jr giving his "I Have a Dream Speech"
Firefighters raising the United States flag at Ground Zero after the September 11 attacks. on the winds of change. With our head held high. Sail on freedom's wind across the sky. "We now face the danger, which in the past has been the most destructive to the humans: Success, plenty, comfort and ever-increasing leisure. No dynamic people has ever survived these dangers. Dreaming the promised vow of your pioneers. Flying high, flying high, flying high! New World Bound- Played during the scene depicting the pilgrims. “New World Bound” was written by X. Atencio and Randy Bright, with music by Buddy Baker . In the Days of '76- This traditional song is played during the Revolutionary War scenes. Two Brothers- Written by Irving Gordon and performed by Ali Olmo, “Two Brothers” is played during the Civil War scene . Brother, Can You Spare a Dime?- Written by E.Y. Harburg, with music by Jay Gorney , “Brother, Can You Spare a Dime?” is played on the radio during Great Depression scene. Golden Dream- Played during the attractions final montage, Golden Dram was written by Randy Bright and Lynn Hart, with music by Robert Moline . The song is performed by Richard Page and Siedah Garrett. 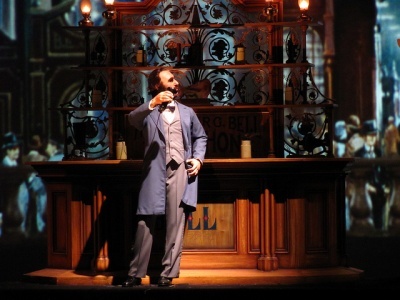 There are 35 Audio Animatronics in the American Adventure. There are 1,024 seats in the American Adventure theater. 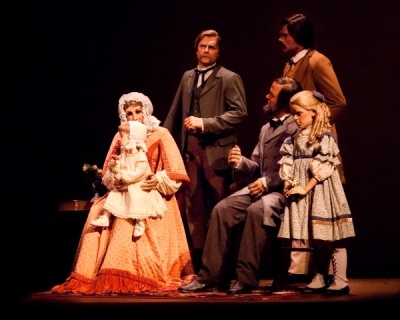 Some of the Audio Animatronics in the American Adventure have wigs made of human hair . Each wig costs $13,000 . The furniture in many of the scenes in the American Adventure are actually antiques. 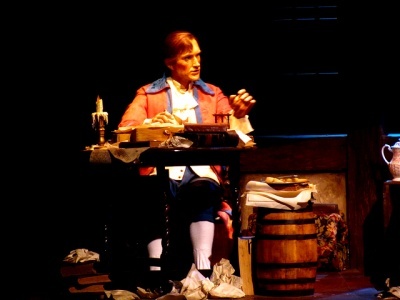 The American Adventure marks the first time that the Audio Animatronics voices come out of individual speakers, not the theaters main speaker system . Disney asked the Library of Congress for permission to recreate FDR's unique presidential seal . Imagineers researched old magazines to find appropriate ads to use in the Great Depression scene . 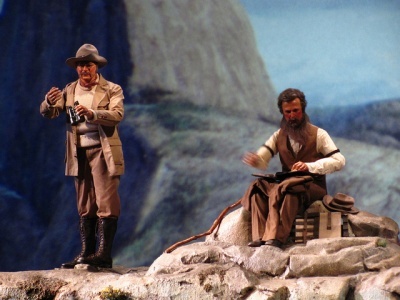 Disney Imagineer Jeff Burke portrayed the brother who fights for the Union in the Two Brothers scene . 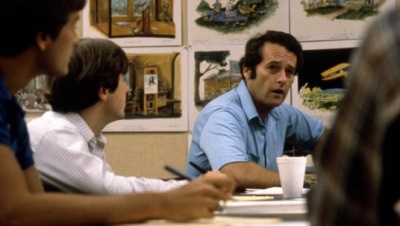 Walter Tyler designed the sets for The American Adventure . ↑ Sklar, Marty. Dream It! Do It! : My Half-century Creating Disney's Magic Kingdoms. Disney Editions, 2013. Print.